All the supergirls get your wonder woman t shirt and get dress-up, yes! Its time to discover your powers and abilities! Dc comics the world of superheroes overtook by the Amazonian princess who is proactively highlighting the superpowers and potrayed as a warrior-lady and become one of the core fictional character as Wonder woman: the legend which empowered women’s rights as the ambassador of US empowering women and girls abilities and supporting them. To all the vertigo and DC fans Honor the power, wisdom and courage of women power and get ready to celebrate wonder woman day on 3rd june 2017 right after the day of movie screening. 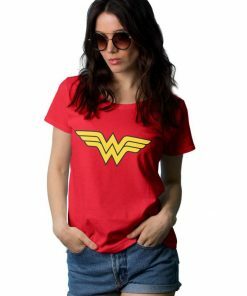 For those fans we planned to present them our most demanding and with an appropriate designed wonder woman tshirts for super legends at the most feasible and affordable rates! So grab it now or else our stock of the year for the wonder legends will change into the SOLD OUT status!